Char-Yeari Kotha by Pramath Chowdhury Bangla story book pdf. Linguist, poet, essayist and fiction writer Pramath Chowdhury was born on August 7, 1868 in Joshor district in Bangladesh. His outstanding contribution to the development of the Bengali language and literature. His masterly and creativity writing has enriched to Bengali literature. He called as the father of the usual prose. He is known as 'Birbal' of Bengali literature. His published books are- Ahuti, Ghoshaler Trikatha, Nil Lihit, Sekaler Galpo, Nanakotha et. 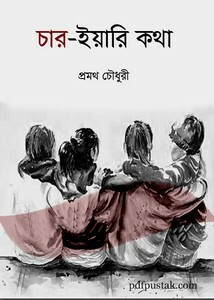 readers can read another popular book of his written- Char-Yeari Kotha. ebook quality is very high but pdf size is very little only 928kb.